The Bloomberg Consensus retail sales estimate was a rise of 0.2%, but sales came in at 0.0% and the details were ugly, emphasis mine. Consumer confidence may be strong but it still is not translating to strength for consumer spending. Retail sales were unchanged in April vs Econoday expectations for a 0.2 percent gain. Excluding autos, sales did rise but only barely at plus 0.1 and below expectations for 0.5 percent, while excluding both autos and gasoline, sales rose 0.2 percent vs expectations for a 0.4 percent gain. The surprising part of the report isn't the weakness in motor vehicles, which was signaled by weak unit sales and which fell 0.4 percent in the month, but weakness in some of the core readings including department stores which fell a very steep 2.2 percent and electronics & appliances which fell 0.4 percent for a 7th straight decline. 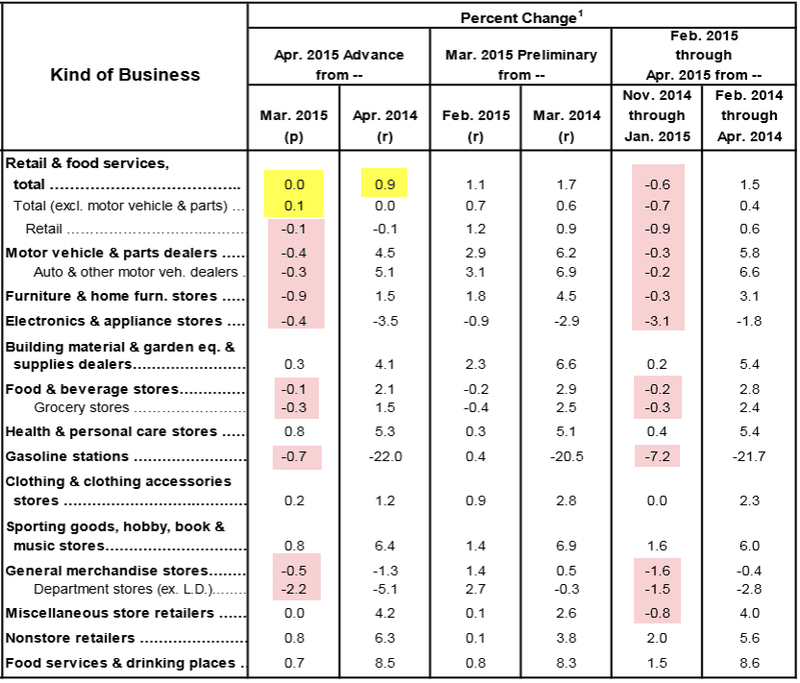 Both furniture and food & beverages also show declines. Year-on-year rates show just how weak growth in the retail sector has been. 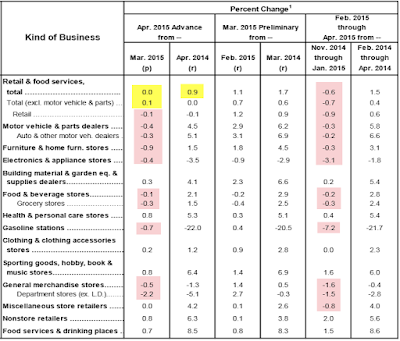 Total retail sales are up only 0.9 percent year-on-year, down from 1.7 percent in March. This is the lowest rate since late 2009. Excluding motor vehicles, year-on-year sales are unchanged, again the lowest reading since late 2009. 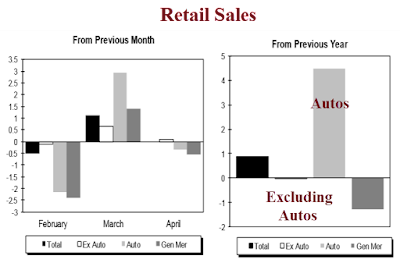 Ex-auto ex-gas, sales are up a respectable 3.4 percent but, compared to 3.9 percent in March, are going in the wrong direction. I mocked the Fed on April 29 in Fed Cites Weather, "Transitory" Factors in FOMC Statement; What About Consumer Sentiment? 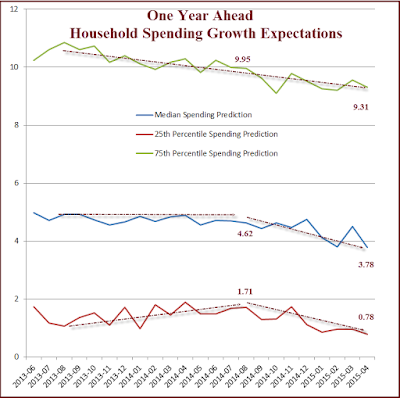 Household Spending Growth Expectations Plunge; Recession Already Started? Every month the Fed does a Survey of Consumer Expectations for inflation, earnings growth, income growth, and consumer spending growth. 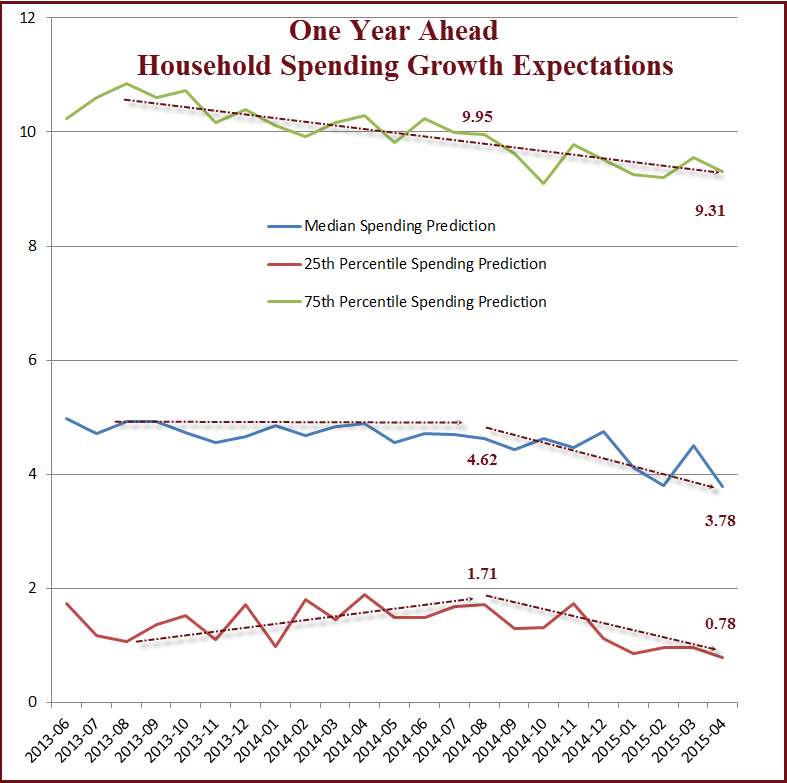 Yesterday, I stuck my neck out regarding consumer spending projections: Household Spending Growth Expectations Plunge; Recession Already Started? Downloading data from the Fed, I produced this chart. Should these spending projections prove to be correct, a US recession that few if any economists see coming, has already started. The Fed's own survey shows spending sentiment is weak. The data shows how weak. Amusingly, the Fed says "consumer sentiment remains high". And Bloomberg does not believe its own sentiment numbers either. Following today's report, I move my position from a recession may have started to a recession is now likely underway. I suspect economists and the Fed will still believe it's "transitory". If so, look for the term "technical recession" because no one seems to believe it. Heck, they do not even believe their own data.